March 2015: Neighbourhood Plan area and Sneinton Neighbourhood Forum have been approved by Nottingham City Council! For more info check out the Forum website. The Sneinton Neighbourhood Forum has now been constituted as independent group (Sneinton Alchemy a member) which will take the Neighbourhood Plan development process forward. Individual community members, stakeholder groups and businesses are represented. Membership is open to all: both individuals and groups/businesses, whether inside or outside the plan area. (Only those who are over 16 and living or working inside the area will have voting rights). The membership has met and exceeded the 21-representative minimum but will continue to grow as more people and groups realise the value in having a voice during the plan development stages. You can sign yourself or your group/organisation/business up to the Sneinton Neighbourhood Forum here. You can also check out Neighbourhood Plan news on the Sneinton Neighbourhood Forum website. 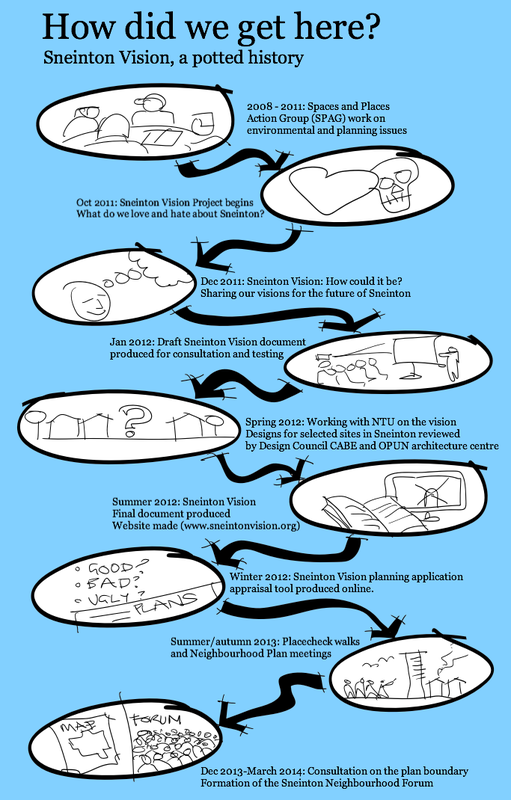 The final Sneinton Vision project statement, is available to browse or download from the sneintonvision.org website. We've run 3 consultation events, gratefully received hundreds of your ideas and comments, put out a draft version, tested it with the professionals and the community... we even published the Sneinton Vision newspaper! Many thanks to the hundreds of people who contributed and commented over the months- your views and ideas are the core of the Vision. We also got very useful feedback from our NTU/CABE design review panel. Sneinton Vision was a project funded by CABE (Commission for the Built Environment, part of the Design Council) and carried out by OPUN (the architecture centre for the East Midlands) in collaboration with Sneinton Alchemy as the community partner. The project created a Neighbourhood Design Vision for Sneinton, based on the ideas and vision of the people, groups and businesses of the area. You can find out more about what a Neighbourhood Design Vision on CABE's website; they have a section on localism and planning, and plenty of resources on neighbourhood planning. Why is this important for Sneinton? • Cuts are reducing services- changing the way buildings and spaces are used in our area. • The planning system is changing- development will be made easier, and local opinion needs to be clearly heard. • We'll have to do more for ourselves- the Government's localism agenda is placing more demands on the community. • Big developments are happening all around- Eastside Gateway and Waterside have had major regeneration proposals, The Island Site, the former Carlton Road Coop and Daleside Road laundry site are all proposed major supermarket sites. How do these link to and affect Sneinton? No one seems to have thought through the impact on Sneinton people and businesses. • There is no current Design Vision or Neighbourhood Plan for Sneinton, other than the Sneinton Market area. 1: The Sneinton we love and want to improve. Finding out from Sneinton people the best and worst bits of Sneinton as it currently is. 5: Finalise the Vision: Make adjustments from Step 4 and get buy-in from local groups and people. So we've produced our draft Neighbourhood Design Vision (scroll down for more details)- the next step is to test it against some development proposals for the area. We need to try it out to see if it is going to be a useful tool to help us assess real development proposals, and to help us do this we have enlisted the help of the Architecture course at Nottingham Trent University. 80 of their 2nd year students have spent a month coming up with designs for 3 sites in the area. They have used the draft vision and held their own consultation event in Sneinton to get feed back from locals. Now their designs are complete and will be used in a Design Review organised by OPUN and CABE as a way of testing the draft Sneinton Vision. Our first full draft Neighbourhood Design Vision statement was uploaded to the site, put together based on over 200 detailed comments received during our consultation process (scroll down for more details of that). However, it was still a draft, so we asked for any comments (positive or negative) to be emailed back to us. This draft vision statement was be reviewed by a Design Review panel from Design Council CABE. A number of stalls run by local cooks sold food that represented some of the diverse cultures of Sneinton- it was a sociable evening for Sneinton to come together around something that is dear to us all- food! For Sneinton Vision, the evening was be a chance to engage widely with the community and move the project on to the next step. This involved people imagining the future of Sneinton, and how the streets and buildings of the area might be in years to come. Activities for people of all ages were arranged on the evening to make for a fun, interesting and engaging experience. Free samples from the food stalls, funded by Sneinton Vision, were available. 1. Our favourite places, and why we love them. 2. Places we think could be so much better with just a little help. This is the first step in us imagining how we want Sneinton to be in the future, and will lead on to agreeing some shared principles for our Neighbourhood Design Vision. Pink pins show places we love, yellow our ideas for improvements. We've also been interviewing Sneinton residents about their impressions of the area and their ideas for the future- we'll be posting some of the interviews here. Here is CJ Lyon in conversation with Tom Hughes of Sneinton Alchemy about the Sneinton Vision project and the kick-off event at the Secret Kitchen Cafe launch party. ...so we can make sure that the real voice of Sneinton goes in to the Neighbourhood Design Vision. - if you would like to add your real voice to the debate, you can do so by sharing with our Soundcloud. Record your message about Sneinton to your computer, mentioning particular places if you can. From our Sneinton Alchemy Soundcloud page, click the 'share a track' button. Select the sound file, fill in the details, and click 'share a track' at the bottom of the page. If you have a smartphone, you can do all of this using the free Soundcloud app (iPhone or Android). If none of that works for you, drop us an email and we'll fix an interview with you!